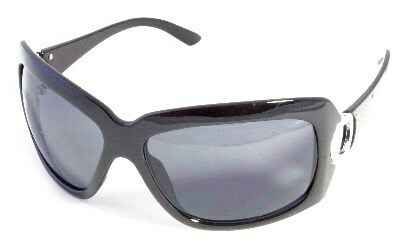 The large shiny black frames on these fashion sunglasses are perfect for achieving the celebrity look. A little sparkle has been added along the temples just for good measure. Will they suit me? These sunglasses have a squared frame which may not suit you if you have a sqaure face shape. With a slight wrap, they are best suited to an oval or an oblong shaped face. These frames are a small fit. Frames: shink black plastic with silver detail.